Rotten Tomatoes Plot: Denzel Washington returns to one of his signature roles in the first sequel of his career. Robert McCall serves an unflinching justice for the exploited and oppressed - but how far will he go, when that is someone he loves? Directed by Antoine Fuqua. After administering another beatdown, Denzel urges, "I expect a five-star rating." The two-time Oscar winner is (once again) terrific, but Fuqua saddles him with listless adversaries, superfluous side stories and a 129-minute runtime. 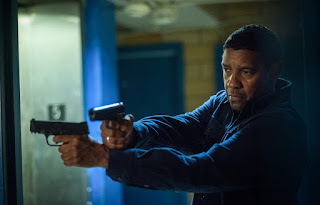 That's a lot to overcome, despite some of the coolest (albeit one-sided) scuffles since... 2014's The Equalizer. Washington even manages to slip in a few bits of humor, as an attentive Lyft driver (great idea) but the pace slows to a crawl at inopportune moments. One can only imagine how much better Denzel's first sequel would have been, had Fuqua left him to his own devices.